شعار صربيا من أقدم شعارات النبالة في أوروبا من 1882 ثم تغير في 2004 وهو من رموز صربيا الوطنية. ويمثل الصقر قوة الجيش الصربي. ^ J. Kovacevic (1953). Medieval Clothes of the Slavs in the Balkans. صفحات 19–97, 183–210. ^ Mitja Velikonja. Religious Separation and Political Intolerance in Bosnia-Herzegovina. 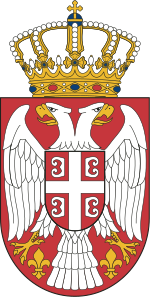 صفحة 187. nations (in a symbolical sense as well, for example, by removing the cross from the Serbian coat of arms but keeping the four stylized esses), and to socially curtail and politically marginalize religious communities and religion in general. آخر تعديل لهذه الصفحة كان يوم 17 يوليو 2018، الساعة 00:00.